If I can’t have a summer vacation yet, at least I can have these milkshakes. It’s a good compromise. Actually, I’m sort of on vacation right now visiting family on the East Coast so I can’t complain (vistas! history! the ocean! not having to do dishes!). 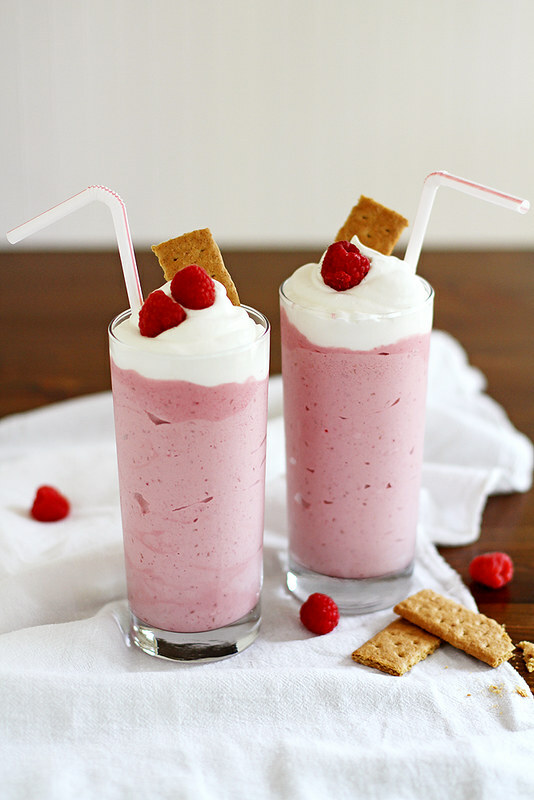 But seeing as I don’t also have one of these dreamy raspberry cheesecake milkshakes in front of me at this very moment, it’s just not a complete getaway, ya know? Vacation. Milkshake. Repeat. That’s what I want/need. I’m no milkshake connoisseur (is that a thing? Because if it is I want to be it), but I will say I’m very picky when it comes to how I like ’em. They have to be 1) creamy, 2) smooth, 3) thick, 4) not too sweet and 5) simultaneously spoonable and sippable. This variation, blended with tart frozen raspberries, sweet vanilla ice cream and tangy cream cheese, meets all the requirements. The fresh whipped cream, graham cracker and raspberry topping is just the cherry on top — er, the raspberry on top. Since summer is finally here, I say we toast to it with these milkshakes. So head over to the KitchenAid blog for the recipe and let’s kick off our heels, put on some flip flops and go on summer vacay in shake form! See you there. Milkshakes will always do, vacation or not!! And this flavour?! Unreal! Wow that looks amazing! So creamy and fresh 🙂 I may have to try it! Yeah for vacation and yeah for the East Coast. I hope it’s been great so far! These milkshakes are awesome. Love that color! 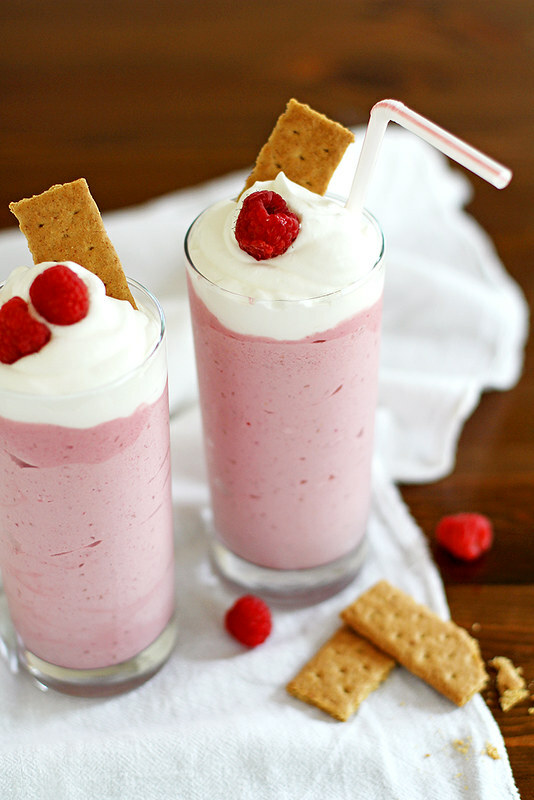 Raspberry cheesecake in milkshake form? I’m totally down 🙂 These shakes look killer awesome! Even though I just came back from vacation, I am already in desperate need of another one. I think these milkshakes might help me! Looks super delish! Raspberry cheesecake is only second to coffee cheesecake in my opinion, so I can’t wait to try these out this summer! Yum! Ok, now I want all the milkshakes! That color is gorgeous! There is so much to YAY about in this post! Vacations, Summer, pink drinks that taste like cheesecake. Totally obsessing over these girlfriend! Have fun! Pinned! The milkshake looks super yummy. all i want is try it out. These milkshakes look like the perfect way to welcome summer! Wish I was sipping one now! Yeeeeeeah, have a wonderful relaxing vacation! These milkshakes are making my mouth water like whaaaaaaaa – headed over to KA to see what the heck is in these gems! i like your requirements for a good milkshake 🙂 i tend to agree! i can’t wait for the short season for fresh raspberries here in MN. i hope you’re having a blast on the east coast! My milkshakes HAVE to be thick! Love this though I might substitute some of the dairy.